The new power established in Russia after the Revolution intended to create not only a new country, but also a new culture. Though the period of artistic freedom did not last very long, the architectural image of cities started to change significantly. 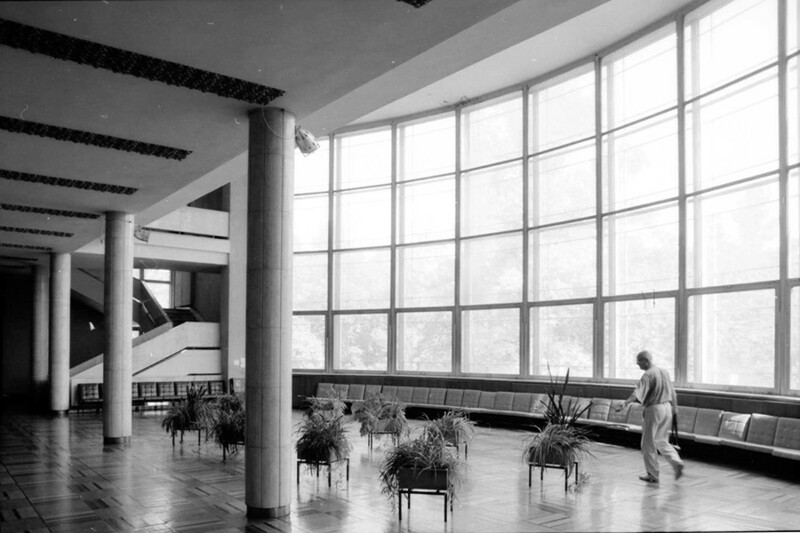 American historian of Russian architecture and expert photographer William Brumfield recently gave a lecture at the Jewish Museum in Moscow about photographing Soviet avant-garde architecture. Afterwards he shared with Russia Beyond photographs of ten his favorite avant-garde buildings across Russia. Professor Brumfield is first of all famous for his research and photos of the ancient Russian buildings, mostly churches and wooden architecture of Russian North. But it appears that avant-garde has always been one of his interests. 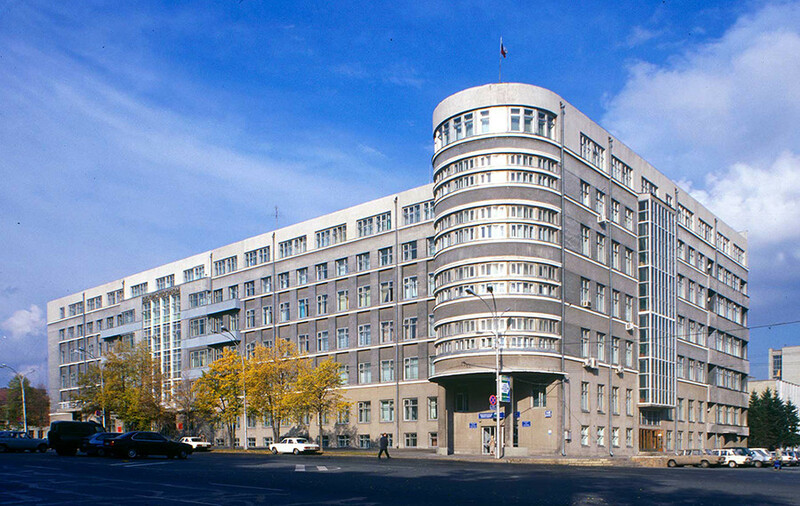 This is probably one of the most famous Constructivist buildings in Moscow. Now it is in emergency condition, but guided tours are still taken there. This is a unique example of the commune house built for high rank staff of Narkomfin (the Commissariat of Finance) under the project of architects Moisei Ginzburg and Ignaty Milinis. Brumfield has photographed it many years. 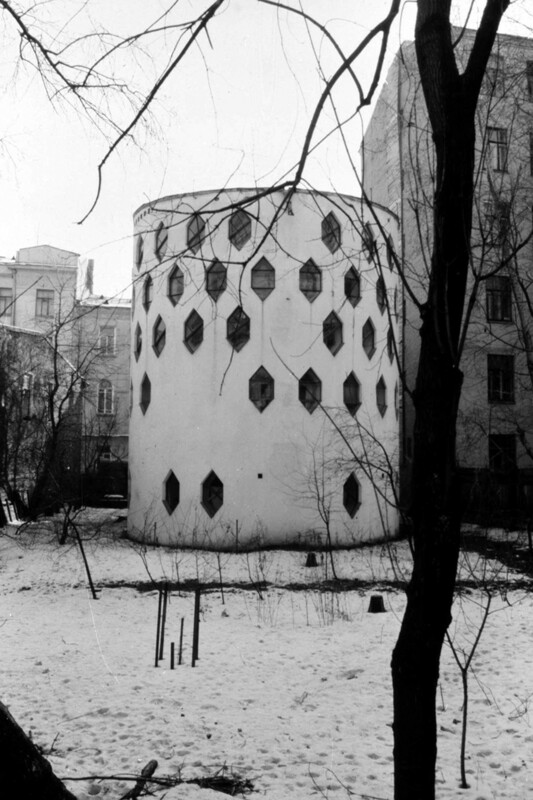 This house was built by Soviet architect Konstantin Melnikov as a studio and single dwelling for him and his family. This was unique for Soviet Moscow of those times, since private property had disappeared in cities, and separate houses had been replaced with big apartment buildings. 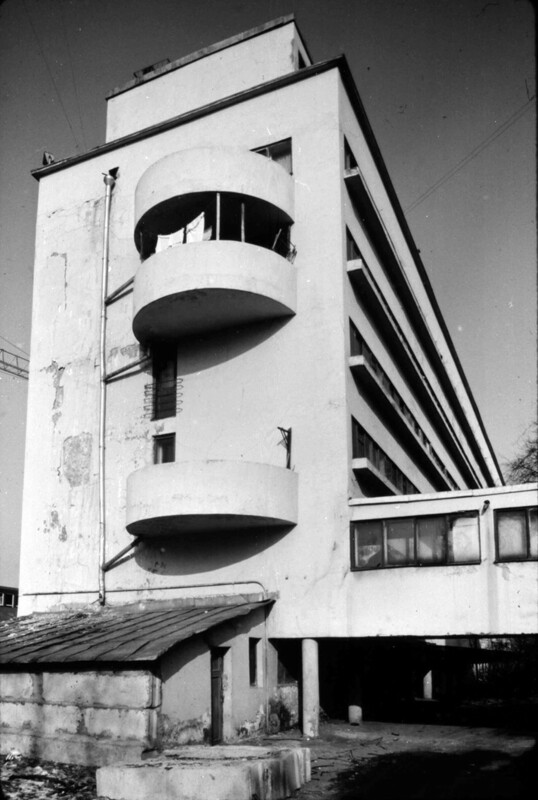 Melnikov was allowed to build his experimental innovative project because it was planned to use the oval shape in future in case of success. Now the house is open as a museum of the Melnikovs. This building can be probably considered as a symbol of Soviet state ideology. Built on the ruins of Simonov monastery necropolis (destroyed by Bolsheviks), it was to be a palace for the proletariat, new people with a new mind. It was important to create a new form for the place where working people would spend free time. 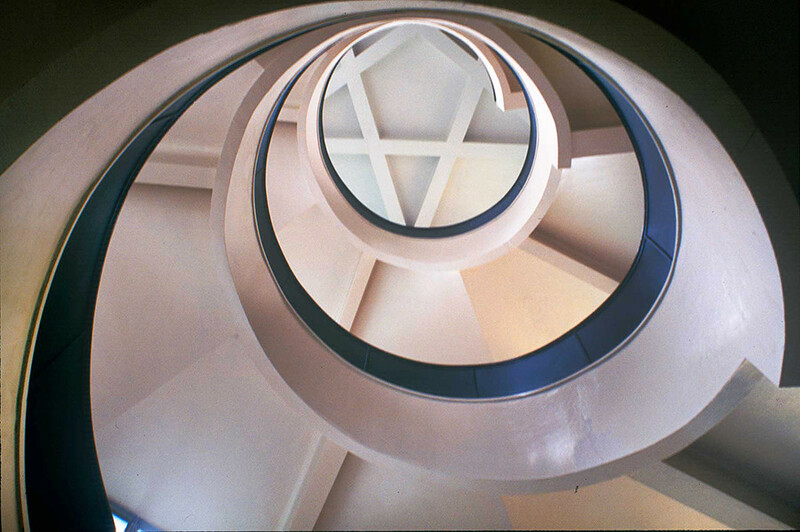 The architects, the brothers Vesnin, were aware of work by the famous modernist architect Le Corbusier. Like Ginzburg and Milinis in their design of the Narkomfin building, the Vesnins used massive pillars instead of walls and arranged the spaces and forms in a free way. The building consists of a club, library, big halls. Now there is a popular space for lectures and educational programs. Built as a garage for English Leyland buses, this architectural masterpiece was a project of Konstantin Melnikov and the engineer Vladimir Shukhov. 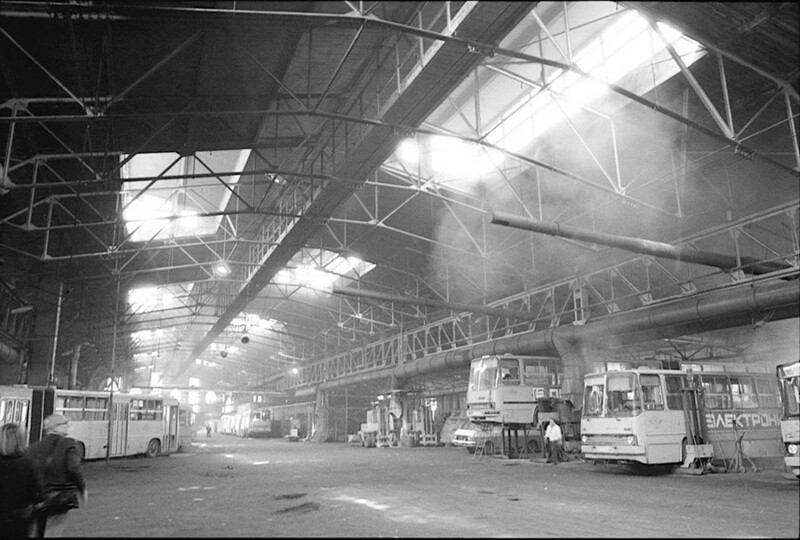 This is a unique photo taken by William Brumfield when the Bakhmetev Garage was still used to repair Moscow public transport buses. It was later turned into the popular contemporary art museum Garage. Since 2012 the large building is the site of the Jewish Museum and Tolerance Center. In the 1920s and ‘30s, rapid industrialization of areas in the Ural Mountains led to a construction boom, particularly in the city of Sverdlovsk (Yekaterinburg). 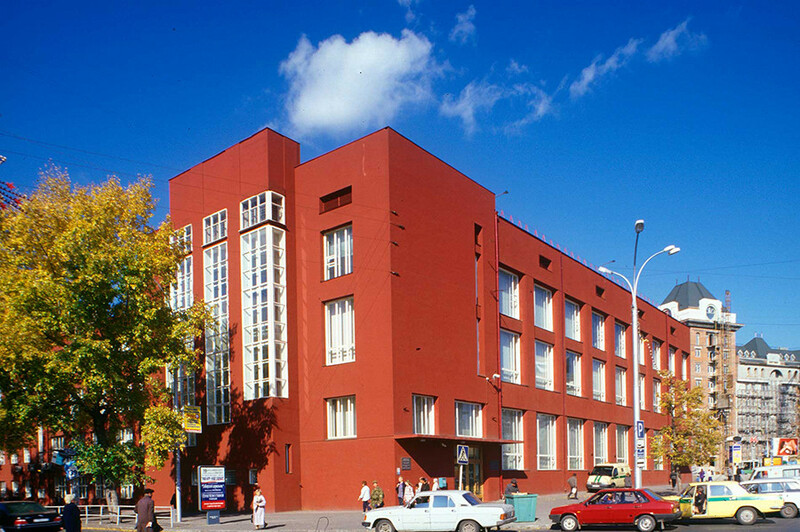 The legacy of that expansion includes prime examples of Constructivist architecture. Read more about those buildings in our article. Brumfield’s photos of Russia, including Yekaterinburg, are now hold in the Image Collections Department of the National Gallery of Art in Washington DC. “The preservation of historic buildings from many periods in Ekaterinburg is documented … in photographs taken in 1999 from the collection of William Craft Brumfield. 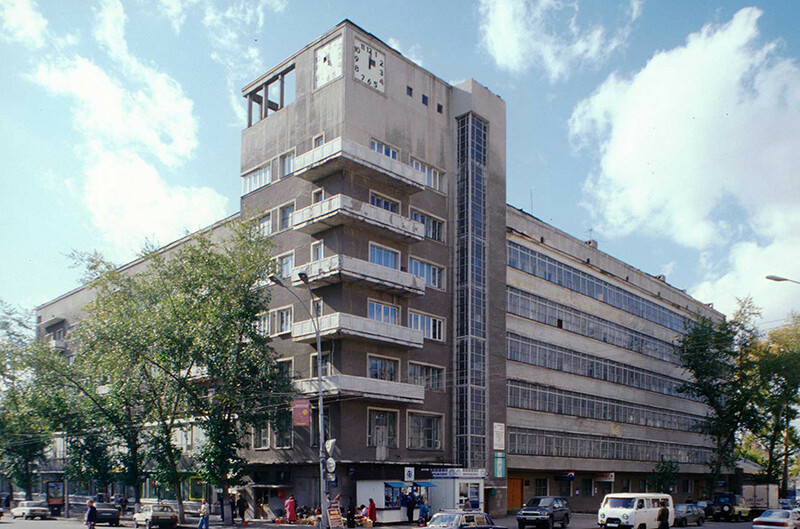 Of particular note is the constructivist architecture—commercial buildings, apartment blocks and office buildings—built during the 1930s’ Soviet five-year plans,” according to the Gallery's website. 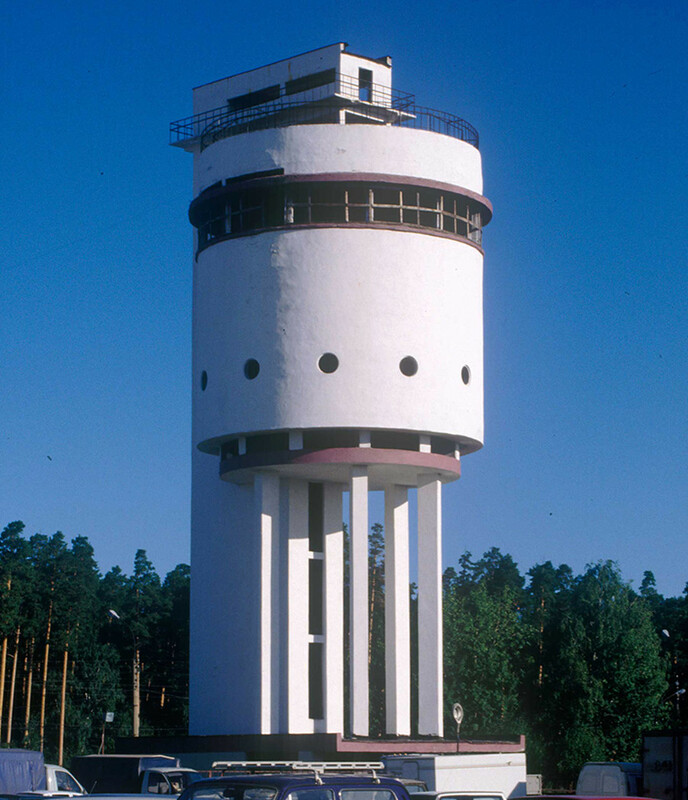 Officials of UralMash heavy machine production decided to build a water tower for their workers living in a socialist settlement under a separate project. Moses Reisher won the design competition with his plan of using Constructivist principles. Under the project two geometric figures, a prism and a water tank cylinder are crossing with each other. In 1950s there was no need in water tank anymore. The building was planned to be made into café, but the idea languished for many years and the tower was abandoned. Now restoration work has been made. 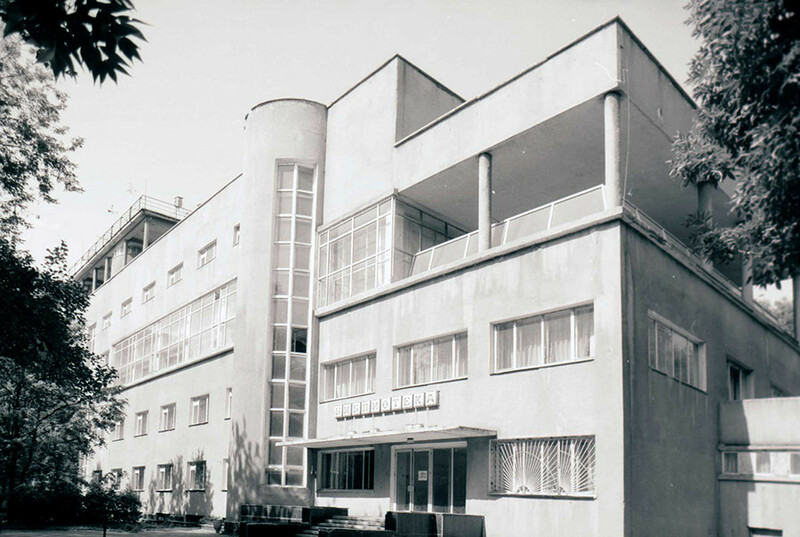 While preparing a building design, Andrei Kryachkov used familiar Constructivist ideas and innovations. The Gosbank (State Bank) building is a part of the Lenin Square architectural ensemble situated in the center of the city. This is an asymmetrical building in form of a Russian letter П and different wings have different heights. Interestingly, the northern façade has no windows since it was planned for vaults and storage rooms. 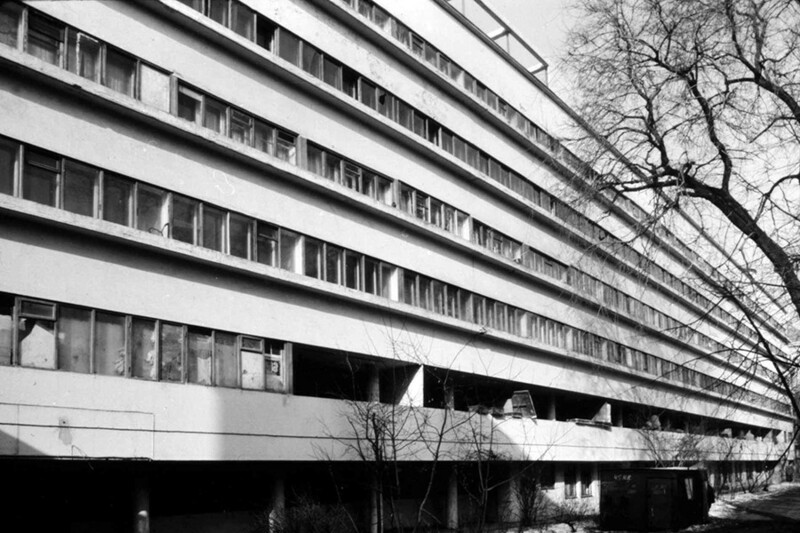 This building was constructed for the regional Executive Committee alongside with a nearby the so-called 100-Apartment Building, where the employees of the committee lived. Andrei Kryachkov, who designed these buildings, tried to aesthetically comprehend the almost unlimited possibilities of reinforced concrete, metal and glass. This building was first in Novosibirsk to use lifts. Later the original plan was somewhat modified with various extensions. This was an apartment house for employees of the regional consumer goods and sales management. It is building in the form of a corner (or Russian letter Г) and has facades on two streets. The ground floor had stores with big windows while other floors had pedestrian galleries also enclosed with glass. The building is still an important part of the city’s architectural ensemble, although in the background another, much higher building was built in a different style. Before the industrialization of the country Khabarovsk had a somewhat disorganized plan, but the socialist state massively constructed new streets. The Far East bank is now an office building and an object of cultural heritage. 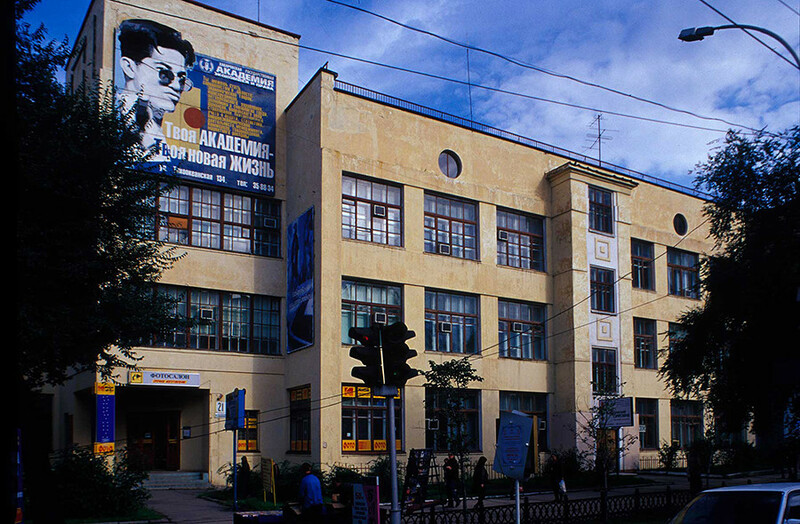 It was designed in Moscow by the architect Vladimir Vladimirov, who worked with other Constructivist architects. A number of buildings in Khabarovsk of this period were built by prisoners of Bamlag.